Starts International Hawaii, Inc. We are licensed and bonded real estate agent and travel agency and doing business in Hawaii for over 30 years. This unit is one of only a handful of units located on the ground floor in the Beach Tower (tower closest to the beach) with an extra large lanai incl. grassy lawn. It faces the preferred pool side, making the pools, beach and BBQ facilities accessible directly from the lanai. Please note that this unit books quickly. 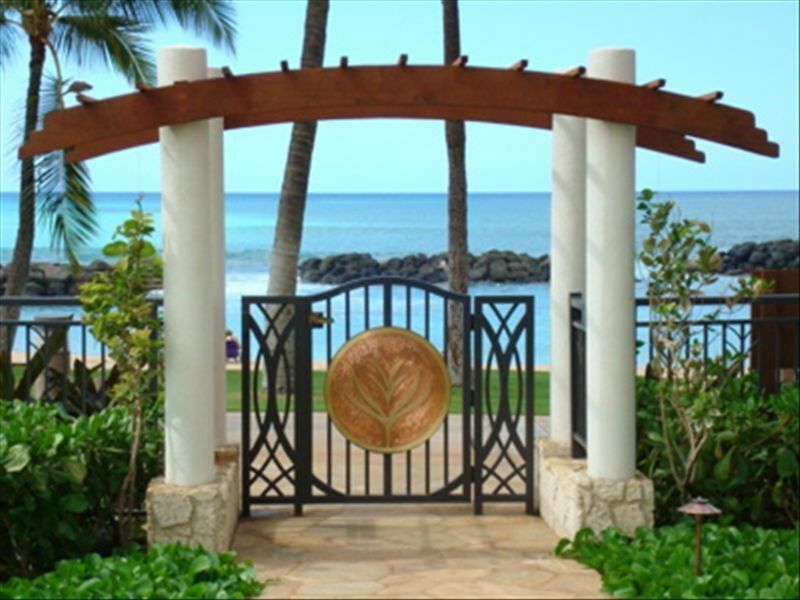 Location allows guest to access pools and ocean and BBQ grills directly from the Lanai. One of the newest beach front resorts in Oahu, Hawaii. Lagoon pool is in front of this unit. Guests can access to the pool area from their mini-garden. Bosch front loading washing machine. Laundry detergent provided. One standard size parking. Add'l parking is available at $30+tax per day payable to the Front Desk via credit card only. Complementary internet service in the unit. Stocked with small appliances, flatware, silverware, and glass ware. Two lanai in the unit. A mail lanai is along with living room. Another lanai is belong to a master bedroom. Check in service will be provided at the site. We couldn’t have asked for a better unit. The ground level access to the pool and the beach was the best, especially with four kids. The unit was clean and had all the amenities needed for a perfect, relaxing week. We would definitely stay here again. We really enjoyed staying in this unit. Although you won’t have a view of the ocean, it is just steps away. Conveniently located near the pool, gas grills, and the pool bar. The unit was clean and stocked with basic toiletries, as well as beach towels and beach toys (including snorkels, fins, and masks). Overall a great experience and would definitely like to stay again. We stayed here for a week with our three children and it was one of the best experiences we’ve ever had. The check in process is a breeze, and the unit was 100% as advertised with a clean, modern feel. The access to the pool and beach was absolutely wonderful and everyone we met staying at the villas were also very happy with the location and amenities. We loved having dinner on the lanai, watching the sunset a few steps away at the pool bar and relaxing at the perfect lagoon beach. I highly recommend this unit to anyone looking for a really great getaway. My children liked it very much because I could walk out of the pool a few steps from Lanai. There are also two hot spas, so it's good for cold weather. If you have kids that love the Pool get this Unit NOW !! Closest to the pool. VIP gate into the pool area. Close to the Ocean. Would book this Unit again for sure. We loved the ground floor unit with direct access to pools + beach that didn’t involve an elevator ride. Facilities are quite nice, though several minor frustrations with the appliances (oven takes forever to heat, main AC can’t cool below 78 per maintenance man...). Very low-key vacation without annoyances of loud restaurants or noisy guests. Lovely!